dwpeate wrote: Well Benetton played Cardiff at home in Italy so they've not actually done a three week tour at all. Cardiff on the other hand played both Italian teams on consecutive weekends in Italy. It has improved a bit though - all the teams with two away games in South Africa stay around for a week; and the South Africans themselves get their games in home or away blocks. I mean September in Italy is absolutely great. Still warm enough to jump into the ocean as well. In the first four rounds of Top 12 (total: 24 matches) no one drop goal has been scored. Almost no one player attempts drop kicks; the only two attempts I've seen this season were in a situation of advantage, so the player drop-kicked "for free" because he was sure to keep the possession of the ball. This type of marking became rare in your championship too? There have only been two I think in the first 6 rounds of Premiership Rugby. They have really gone out of fashion. I think there was a small spike of interest in the six nations a few seasons ago, can't remember which edition though. Soon petered out again. I think there have been a few scored and attempted in the pro14, including one that was charged down yesterday if I remember correctly. I suppose the "culprits" are the nowadays defensive lines, so flat and assaulting. Anyone know what happened to Leonardo Sarto? He was released by Glasgow at the end of last year and you'd have thought both Italian Pro14 teams would want to snap him up, but neither did. Figaro wrote: Anyone know what happened to Leonardo Sarto? He was released by Glasgow at the end of last year and you'd have thought both Italian Pro14 teams would want to snap him up, but neither did. Still injured after two operations on his shoulder. Comeback due to be in december. Agent is already looking for teams. RWC hopes are still alive for him. 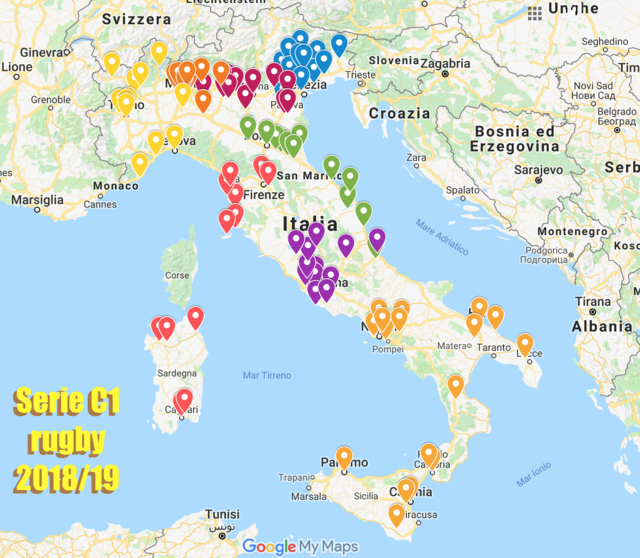 Padova and Calvisano lead the ranking and they seem destined to the play-off, but for the third and fourth positions there are now many pretenders: Rovigo, Fiamme Oro, Viadana, maybe also Florence, Valorugby Emilia, San Donà and Mogliano. It's not like it's a total second team or anything. For signs of improvement just look at the U20 team and the domestic sides. It takes time to filter through. It’s not like Ireland fielded a backline who had never played together or anything. 4N wrote: It’s not like Ireland fielded a backline who had never played together or anything. Precisely, there's nothing to be gleaned from the match. Ireland, with twice as many pro teams, has more depth than Italy, shocker. Maybe, but it's necessary to analyse Italy by itself, regardless of a failed conversion next weekend changing the result. What I fear is O'Shea repeating the same way other Italian head coaches followed. Promising start, rise and then fall when the cycle ends. Anyway FIR was extremely stupid to accept this match at the worst possible scheduling. According to a newspaper the organizers ("The Irish community in Chicago") payed 700,000 € to the italian federation. This makes the FIR choice understandable. Only 700,000 when your budget is over 40 million? I understand it even less. It's inconceivable to me Italy just seem to be permanently stuck where they are. Any time there's a glimmer of hope that improvement might finally be happening they stumble. Honestly, I hope Georgia push them all the way next weekend. Last edited by thatrugbyguy on Sun, 04 Nov 2018, 10:25, edited 1 time in total. Armchair Fan wrote: Only 700,000 when your budget is over 40 million? I understand it even less. thatrugbyguy wrote: It's inconceivable to me Italy just seem to be permanently stuck where they are. Any time there's a glimmer of hope that improvement might finally be happening they stumble. Italian fans are who I feel sorry for the most. So many times things have finally looked like they are changing only for nothing to change at all.